Masoumeh Askari, a retired teacher who was imprisoned in the women’s ward of Evin Prison, was sentenced to 5 years in prison. Masoumeh Askari was arrested in Tehran on August 2, 2019, during the nationwide protests last August. She was transferred to Qarchak prison in Varamin and was released after several days. The retired teacher then was arrested again by security forces in December 2018 and transferred to the women’s ward of Evin Prison after spending one month in solitary confinement at the Ministry of Intelligence detention in section 209 of Evin Prison. Ms. Masoumeh Askari was sentenced to 5 years in prison by Judge Moghiseh on February 18, 2019, on charges of ‘assembly and collusion’ and is currently serving her sentence at the women’s ward of Evin Prison. The retired teacher, Masoumeh Askari, has a 14-year-old boy and is his sole guardian. Previously, Iranian teachers took to the streets in at least 32 cities across the country on Thursday, May 10, 2018, to stage protests. Security forces in Tehran violently clashed with the protesting teachers, resulting in the injury and arrest of several teachers. Ms. Aliyeh Eghdam-Doost, a member of the (Teachers’) Retirement Union, Ms. Aliyeh Eghdam-Doost was among six teachers arrested in the teachers’ protest gathering in Tehran on May 10th. She was sentenced to 9 months of imprisonment and 74 lashes. Strike and sit-ins of educators and teachers were also held on November 13 and 14, 2018, and female teachers participated actively in this protest movement. 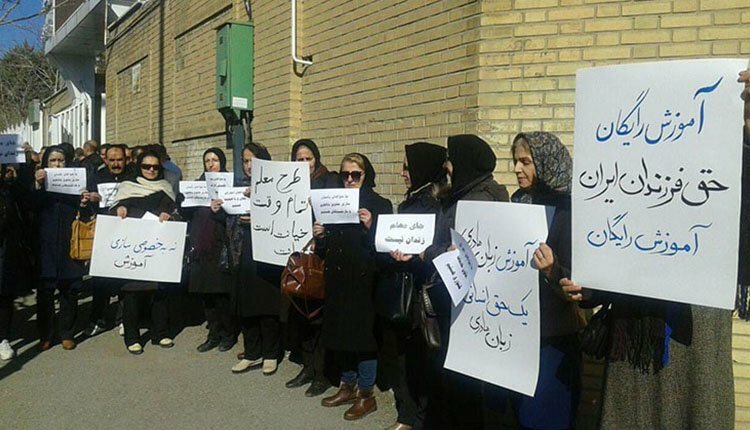 According to the Coordinating Council of Iranian Educators’ Guild Organization, 12 teachers were arrested, 30 teacher activists were summoned and interrogated, and over 50 threatening messages were sent to protesting teachers. Ms. Fatemeh Bahmani, a female teacher activist from Arak, was arrested on November 13, 2018, by the Ministry of Intelligence. Ms. Vaezi, a female teacher, is also among the detainees in Shiraz. Teachers have been repeatedly holding protests against the suppression and imprisonment of teachers, the deteriorating of their livelihood, the inflation, and the decline in purchasing abilities, demanding the elimination of discrimination against retired and working educators.